In my previous post I talked about how great art can depict the feelings that we all share when our belongingness needs are being satisfied by being with friends and family. In this post I would like to present two poems. Both of which use the art of poetry to express the same feelings that are expressed in the art of painting. Many of the artist’s poems are concerned with issues expressed in his essays: nature, truth, and social justice. This poem uses his love of nature to evoke the feelings of simple friendship. This is a powerful interpretation of the desire to satisfy one’s need for belongingness with others. The poem, one of Whitman’s most famous, presents an image of America as a collection of proud, individualistic, healthy and productive individuals. The poem’s genius is that the individual songs are blended together to create a unified and strong America. The poem provides a clear interpretation of belongingness and involvement, and the benefits of each to the individuals as well as society. Both of these poems depict the satisfaction of close friendships and ties to the community. Both go a long way to accomplishing our need for belongingness. This entry was posted in Uncategorized and tagged Arts, Belongingness, fulfillment, happiness, Poetry on August 26, 2013 by oliver. This post builds on the theme of the previous posts. It presents the fourth fine art – Ballet. The piece below is a masterpiece of music and choreography depicting the innocence of childhood and the security of the child who is protected by a loved one. In this ballet scene, the character is protected by its mother, Nature; however, there is more to the scene. The character, now secure in its basic needs of food, warmth, and safety, is becoming restless and is interested in reaching out to others, the nymphs. The description below is an excerpt from my book. I think that this one artistic piece captures perfectly and with great beauty the feelings that we all share when our needs for food, clothing, shelter are satisfied and we begin to look for the next chapter of our life – belongingness and the desire for being with others. The music of this ballet is considered by most experts to be a turning point in the history of music. It is one of the first modern ballets and the music is one of the composer’s most well known works. The music and the dance evoke the afternoon in which a single faun, nurtured and protected by nature, awakens to the sight of nymphs. He flirts and chases the nymphs but with no success. He soon retreats back to his place of rest. This short ballet represents a character whose protector, Nature, gratifies both his physiological and safety needs. It also presents the beginning emergence of a new higher need – involvement with others, which cannot be satisfied by the faun’s protector alone. This entry was posted in Uncategorized and tagged Arts, Ballet, fulfillment, happiness on August 5, 2013 by oliver. This book is meant for everyone. It provides the roadmap for all of us no matter which gallery of life we may be in today. 5) anyone who is looking for inspiration and a little help along the way. 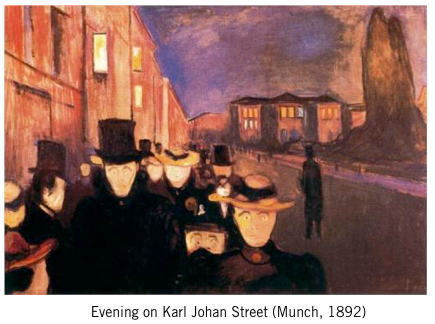 If you pass others on the street and they kind of have the look of those in the painting by Munch, you are not along. This book can help you break from the crowd, like the lone figure in the painting, and begin your journey to the blue horizon. This entry was posted in Uncategorized and tagged Arts, entrepreneur, fufillment, happiness, Intrapreneurship, Midlife crisis, small business on June 28, 2013 by oliver. In my two previous posts I mentioned that the roadmap to happiness is made up of both “prose” and “art.” The “prose” is the ideas of modern thinkers and a few ancient philosophers. 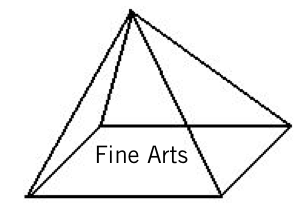 The “art” is the works of the masters from the world of the fine arts. 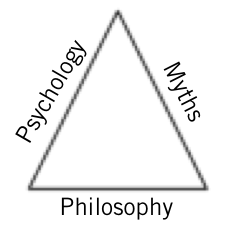 So, the works of the thinkers, which I call “Prose” are those of 4 ancient philosophers and just three modern thinkers. And the works of “Art” represent 78 masters of the Fine Arts of the past 500 years. 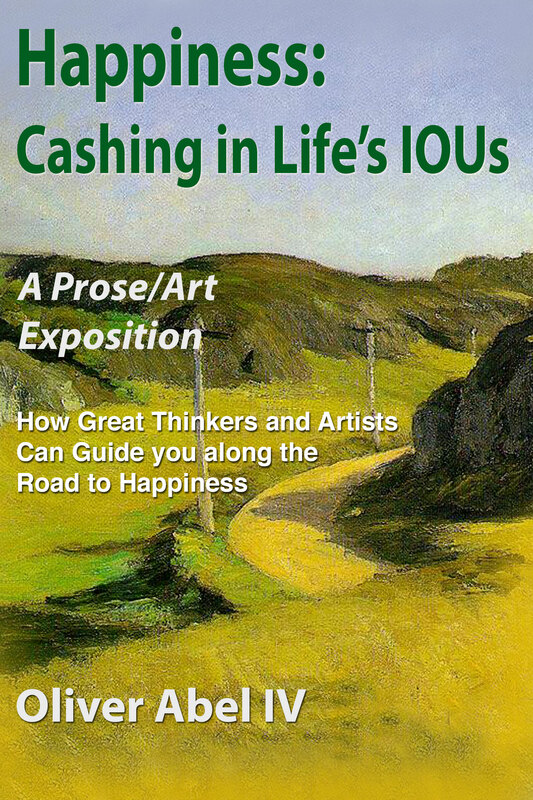 In all, we have 85 contributors for a great reading experience called the “Prose/Art” Exposition. What is really cool about all of this is that the thinkers reinforce one another and the artists also reinforce one another. In fact, the thinkers and the artists reinforce one another, which is very comforting. If the thinkers disagreed as to the best roadmap to happiness, or the artists disagreed among themselves as to the best roadmap, or the thinkers and the artists disagreed, we would be in trouble. But, they all say the same thing, just in different words, images, dance, or music. This entry was posted in Uncategorized and tagged Arts, Classics, fulfillment, happiness, Philosophy, psychology on June 26, 2013 by oliver. My book, to be published shortly, is all about the road to happiness, which we are all looking for. The book gives each of us three vantage points for reaching happiness: 1) intellectual ideas, theories, and research from great thinkers, laying out the roadmap for all of us to use, 2) works from the masters of the fine arts that validate the roadmap of the thinkers and inspire all of us forward in life, and 3) the vehicle within each of us that is needed to travel the road with the map in hand and inspiration by our side. The classicists, especially those studying the myths, do a good job of explaining how to find happiness based on the adventures of past heroes. But they are vague as to what needs to be done to prepare for the adventure. They are very good at locating the road around the corner leading to the blue horizon, but are vague as to how to get to the corner to begin the adventure. The classicists discuss the myths in great detail and with great insight. But they are very vague as to what is needed to prepare for the adventure. My book has the answer. This entry was posted in Uncategorized and tagged Arts, Classics, fine arts, fulfillment, happiness, myths on June 17, 2013 by oliver. 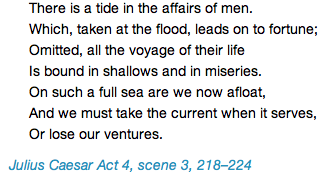 Shakespeare knew the world of the entrepreneur very well (he knew of many worlds very well)! These seven lines speak to the heart of the traits critical to successful entrepreneurship. The traits implied in these lines include: alertness, preparation, courage, confidence, a desire to identify and capitalize on opportunities at the right time, and an orientation towards making decisions today so that life in the future will not be regretted (or regret living a life in the future that is below expectations). There is an article that was just published in a major newspaper quoting statistics about the decline in the creation of new businesses. The many reasons mentioned for the decline are tied to the current economy, aging population, and desire for less risk in an increasingly risky world. I think that the real reasons for the decline are different and I talk about them in my soon to be published book. I think that society has a large part to play in the decline. I don’t think that would-be entrepreneurs are less educated or trained. I don’t think they are less motivated. But I do think they are misguided. I think that society has been sending a signal for some time now that everyone should “live for the moment” and not worry about the future – the government will take care of everything. 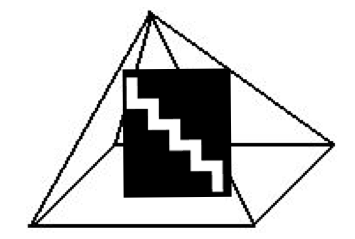 Without an orientation towards the future and a desire to locate and capitalize on new opportunities, new enterprises will not be formed. And perhaps more important, the journey to happiness of these would-be entrepreneurs will cease and the boring world of everyday existence will continue day after day after day. I do have a solution and some much need encouragement and inspiration. Stay tuned! This entry was posted in Uncategorized and tagged Arts, Business, entrepreneur, happiness, Shakespeare on June 3, 2013 by oliver.